In the winter months most anglers in the Upper Great Lakes are focused squarely on hard water fishing. Jake Romanack, the new co-host of Fishing 411 TV is a prime example of an angler who lives for hard water fishing adventures. Ice fishing is a hoot, but it’s not for everyone and it’s not the only way to wet a fishing line in the dead of winter. 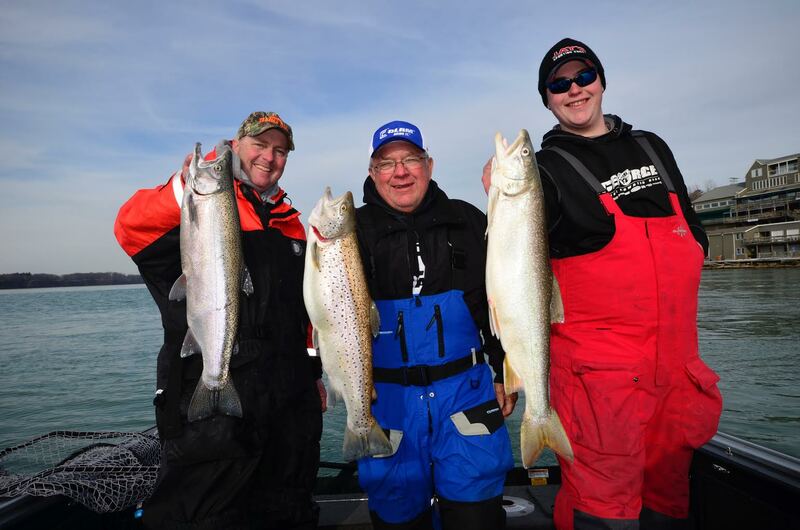 Around the Great Lakes anglers have dozens of noteworthy rivers that cough up outstanding steelhead, brown trout and lake trout fishing. Getting started plug fishing is easy. The most successful baits tend to be those that fall into the “banana shaped” category. Noteworthy lures in this group include the Yakima Mag Lip 3.0 and 3.5, the Yakima U-20 Flatfish, the Lindy River Rocker, the Heddon Tadpoly and the Luhr Jensen KwikFish. All of these baits feature a rather wide and aggressive side-to-side wobble that comes to life even at slow fishing speeds. 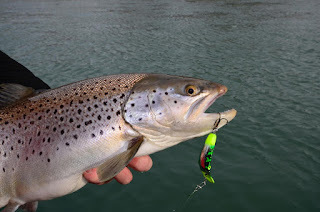 This wandering or searching action seems to anger steelhead, browns and lake trout as these fish literally hammer the bait and often engulf the lures deep down their gaping jaws. One of the most popular ways these plugs are fished is known as drop back fishing. The boat is held in the current by anchoring or using an electric motor or outboard. The baits are in turn played out downstream and the current forces the baits to dive and wobble. Slowly the boat is “dropped back” or allowed to slip downstream covering water and enabling the angler to search for fish. In most situations drop back fishing is conducted with four lines and four plugs fishing off the back and back corner of the boat. In some situations, anglers will add two additional plugs to this set up and run them on small in-line planer boards like the Off Shore Tackle Mini-Board to gain a little extra lure coverage. those finishes going for it!! Drop back fishing dominates with plugs when anglers are fishing in water from three or four feet deep out to about eight to 10 feet of water. In deeper water weights must be added to the lures to get them to bottom in many situations. A simple three way swivel rig is a good way to get these plugs to bottom when fishing water deeper than 10 feet. The main line is tied to one end of the swivel, a dropper with a lead sinker is added to the bottom swivel and the rig is completed by adding a leader of five to seven feet with the diving crankbait of choice. This three way rig can be trolled downstream or the boat can be turned sideways and allowed to drift downstream. So long as the boat is moving fast enough to get the baits wobbling, three way rigging with plugs is very productive. This style of fishing is very common in deeper fisheries like the Niagara River where it would be impossible to reach bottom by simply drop back fishing. Anglers who do a lot of winter plug fishing tend to modify their baits in a number of ways. 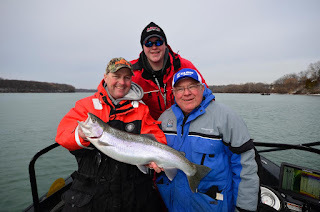 For example, recently I was fishing on the Niagara River and guides there remove the belly hook from their baits to reduce the amount of snags. The bottom of the Niagara River is shale and plugs can easily snag. Removing the belly hook doesn’t hurt the lure’s action, but it significantly reduces the chances of snags and lost baits. Another popular hooking option is to remove the treble hooks and replace them with Siwash style hooks rigged on double split rings or with a small ball bearing swivel. Single hooks snag less, but do a great job of hooking and landing trout and steelhead. Campbell (left) and ice fishing legend Dave Genz of Clam Corporation. and brown trout fishing the Yakima Mag Lip 3.0 crankbait. Plugs are great winter fishing lures, but this presentation can be dramatically improved by adding scent products designed to attract more bites. The problem with most fishing scents is they are water soluble and the scent washes off almost as quickly as it is applied. The better scents on the market are made by grinding up natural forage species and mixing this natural attractant with a sticky jelly that prevents the scent from washing off. Pro-Cure is an industry leader in developing fishing scents designed to not only attract fish, but also to stay on lures. Many Pro-Cure products also have UV added so the scent makes it easier for fish to see the lures in dark or stained water conditions. Winter plug fishing is an exciting way to target browns, steelhead and even lake trout. Strikes are amazingly aggressive and this tactic works anywhere anglers can find flowing water and good numbers of fish.